I was diagnosed at the age of 24. Growing up, I was never very athletic and always thought that I was just klutzy. I attempted to play sports in elementary and middle school but I always felt as though I was too uncoordinated to join any kind of organized sports team. Everything appeared to be “normal” until high school when I started falling UP the stairs – I started walking on my toes sometime in my early teen years which contributed to falling up the steps. While I wanted to believe I was just an extreme klutz, there was always something in the back of my mind telling me that I was not “normal”. In 2003, I had the grand idea that I wanted to start running to get in shape. I didn’t make it a quarter of a block before I was on fall #3 in a matter of minutes. At that point, I began to listen to the little voice inside that knew something wasn’t right – it was time to talk to a doctor. My brother Paul also has LGMD 2J. The most difficult factor about living with LGMD is that my mind and my body are simply not in sync. My mind says, “Go!” and my body screams, “What are you thinking, you can’t do that.” In my mind, I’m able to climb stairs, wear a killer pair of heels, gracefully walk down the sidewalk, carry groceries, and run a marathon. But my body disagrees – I avoid stairs at all costs, I have to wear flat shoes. Simply walking down the sidewalk without someone next to me causes an unexplainable sense of anxiety – carrying a load of groceries into my house feels like I’m trying to move a mountain with my own two hands. And running a marathon would be as difficult as trying to house-train an elephant. My mind says I am fully capable but my body refuses to respond accordingly. There is also a tremendous amount of fear that accompanies an invitation somewhere that I have never been before – especially if I am going alone. When I’m invited to an event, have a meeting for work, or have to go somewhere that I have never been before, I find that Google Earth is my closest ally. I will Google Earth the layout of buildings. Where is the parking lot? How far do I have to walk to get to the front door? Is there a step or a slope at the entrance? Is there anything that could potentially prevent me from navigating the terrain? Although research is helpful, the fear that comes along with “new places” is only slightly diminished by these preemptive measures – the reality is that there may be an unanticipated obstacle on site once I arrive. For me, that’s when the true fear sets in. Even more-so than each of the challenges above, my biggest challenge is admitting that I need to ask for help. As the days, months, and years pass, I have realized that the simplest tasks – taking out the trash, changing a light bulb, going up/down stairs without a railing, stepping up onto a sidewalk without something to hold on to, getting out of a chair, even just walking across the room – have proven to become increasingly difficult. I often wonder if it would be easier if my body worked and it was my mind that was uncooperative. It’s hard to ask for help when your mind tells you the task-at-hand is a common, everyday part of living. I want to prove to myself that LGMD won’t win – that there is a way that I can outsmart this disease. When those moments arrive, I push myself way too far – I do things that I know will ultimately land me in bed and in pain for periods of time. For me, this disease is cyclical. The more I do, the more I hurt. The less I do, the more I beat myself up for not being fully capable – which leads to me pushing my body too far once again. On a physical and mental-strength level, my greatest accomplishment is completing a 5K Color Run in 2013. I may have said, “I can’t go any further,” more often than I said “I can do this.” I may have been the last person to cross the finish line – but I started and completed the race without cutting a single corner. Personally, I’m extremely proud of my recent move. Having LGMD requires a lot of help from others – and as time goes on, this need will only escalate. While I accept this, I don’t allow it to define how I live my life. I recently picked up and moved by myself nearly 900 miles from everyone I know. I left my “muscle” behind, I packed everything up and I decided that I had to truly fly solo to discover just how able bodied I really am. Professionally, I’ve been named a Top 100 Women in Maryland and Top 100 Minority Business Enterprise Owner. Maintaining my professional identity as my MD progresses has been a priority for me from Day 1, so I’m extremely proud of my work. I was also honored to receive the MDA Courage Award in 2016. Having LGMD has greatly affected my compassion and empathy for others. I fully understand the meaning of not feeling well. I understand that hurting and being in pain on a constant basis can be draining. Although I lose my patience with myself on a regular basis, I believe that having LGMD has afforded me a patience with others that I didn’t have prior to being diagnosed. LGMD has also cultivated an ability to approach situations with creativity. Granting little power to that small voice that whispers “I can’t,” I try to turn everything into “I may take an unconventional route but I CAN do this.” I may not get from Point A to Point B the same way that an able-bodied person can, but I’ll find a way to get things accomplished regardless of how outrageous my method is. I’m not “an inspiration”: Just because I’m living each day with LGMD does not mean that I’m an inspiration to all people everywhere. Could I inspire someone living with LGMD to approach the diagnosis with humor and determination? Sure – but I’m not innately inspiring just because I have LGMD and continue to live my life. I am a woman that has LGMD and I am adjusting to my circumstances just like everyone who adjusts to life’s many challenges. Someone that breaks their arm has to learn how to do things differently for a short period of time. Similarly, I’m learning each day how to adjust … and readjust. The only difference between me and a person with a broken arm is that eventually their cast will come off and they will regain full functionality of their arm. LGMD is progressive so I will always be in a time of readjusting as things progress. Don’t make assumptions about my (or anyone’s) abilities: Reserve judgment when you see someone that appears “normal” when seated – you never know what challenges that person faces upon standing. When you see someone in a wheelchair or using an assistive device, please do not assume that we are hard of hearing, that we need to be coddled, or that we want any sort of sympathy or pity. This is our “normal” and while it is challenging, there is no need to treat those of us with MD any differently than you would anyone else. Don’t assume I need (or want) help: Living with LGMD means that sometimes I will need to ask for help for seemingly simple tasks. That said, assuming that I need help is … well, insulting. Sure, I may not be able to do something as quickly or as gracefully as you desire. But that does not mean that I can’t do it. Let me try – if I need your help I’ll ask. It’s that simple. And if I want to push myself to try something that you don’t think I can handle, let me! So it doesn’t end well – so what. To me that’s not failure. It means I tried – and some days, that’s enough. Don’t be afraid to ask questions: Knowledge is power. Knowledge is understanding. Knowledge is compassion. Questions about MD are not offensive. It’s offensive to see you staring at me and knowing that you’re wondering what my everyday life is like. It’s offensive to assume you know what my life is like. I don’t expect you to understand my challenges. 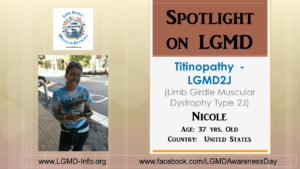 You don’t know – you’ve never lived with LGMD … how would you know? Ask me anything! Surrounding myself with people who are knowledgeable about MD makes my life a little bit easier – but you can’t know if you don’t ask. Don’t look away and pity me – introduce yourself and ask whatever burning question you may have. Run. I would put on a pair of running shoes and I would run as fast and as far as my legs and lungs would allow. After that I would put on a pair of amazing heels and I would dance all night long. Dancing … I miss dancing the most!